We have 3 unique horse barns within 50 steps of each other. There are 4 big box stalls in each barn and every stall has an attached private paddock. Owners do not need to fear their horse being kicked, bitten, or bullied. Most horses quickly learn their hay and feed is theirs alone to eat in peace and at their own pace. In addition to trails around our 160 acre farm, there is fenced acreage for riding. Inside the riding area is a standard size dressage arena with agricultural sand (not dusty) and a 75-foot round pen with agricultural sand. New to Jubilee Stables is our large indoor riding arena and an additional 6-stall barn with an indoor wash rack and bathroom. Inside the West Barn is a boarder’s lounge that is heated and cooled and we provide a Keurig Coffee Maker (tea, coffee, hot cider, or hot chocolate). Of course, each barn has its own locked tack room and we have space for large tack boxes. There is also an outdoor wash rack with a 180 degree washing wand hose for bathing horses. Helmets must be worn by all boarders and riders at Jubilee Stables. Every ride, every time! Stalls range in size from 12X14 to 16X20. Each stall has heated water, mats and an exit door to the paddock. Horses love their freedom to go from their stall to their paddock as they choose. We maintain horse-safe fencing with electric rope braid as the top-line. Pasture board is available in our 2 acre pastures with run-in sheds. Pasture board includes heated waterers, grass year-round depending on the rainfall, safe fencing with strong gates, and hay available in a round bale feeder or square bales fed twice daily if needed. Board is due on the first day of each month and must be paid by the 10th. When paid after the 10th, a $25.00 late fee is due unless prior arrangements have been made. We dispense owner-provided dry supplements with no charge. Liquid supplements require special handling and we will feed those with an appropriate monthly fee. Medications are also an additional cost if administered separately from feed. Elise Lofgren, Ph.D. has been riding since the age of 12 when she began to take lessons with her younger sister, Hayley. 15 years later, Elise is still living and breathing everything equine. She has a bachelor’s and master’s degree in equine science from Murray State University, where she taught basic horsemanship and founded the Murray State University Dressage Club. As an undergraduate, Elise competed on both the western and hunt seat teams at the intercollegiate level (IHSA). She recently completed her Doctorate in Agricultural Sciences Education and Communication at Purdue University. Elise conducts research in the field of Equitation Science and Equestrian Social Sciences, specifically around human perceptions of equine welfare and presents her work at conferences all over the world. Elise regularly rides and competes in USEF and USDF affiliated shows with her Andalusian stallion, TT Calixto. She is passionate in dressage and is pursuing her USDF bronze medal. Most recently, Elise rides under the instruction of USDF Gold Medalist Korin Rinaldo, and has ridden with USDF Gold Medalist Brittany Burson and Oberbereiter Herwig Radnetter of the Spanish Riding School. As a riding instructor, Elise is the diplomat supreme; she is always kind and very clear with her instructions. She enjoys teaching all ages and can help every rider improve their horsemanship. Elise also offers show coaching and horse training on a case-by-case basis. Basic Riding for Beginners as well as English, Basic Dressage, Basic Western, and Jumping lessons are available. Private and semi-private lessons are offered according to our instructor’s schedule. If you are interested in learning how to ride or in moving your riding ability up a level call Elise @ 630-292-1172 or Jubilee Stables 765-296-3075. Korin Rinaldo is a USDF Bronze, Silver, and Gold medalist & international FEI competitor. She has an extensive show resume from training level through Grand Prix on over forty different horses. She has taught a wide range of students from leisurely trail riders looking to improve their safety and skills to FEI competitors. She also has lots of experience starting young horses starting many and bringing them up the levels. She likes to bring out the best in all her students both human and horses while maintaining safety and fun. She has many successful regional, national, and CDI finishes. As well as year end awards both nationally and with local GMOs. Basic to advanced level dressage. Private and training rides are offered according to our instructor’s schedule. We specialize in retired horse care. We know owners want to provide their horse with best facilities and yet be easy on the pocket book. For the absentee owner, we care for your horse as you would. We also maintain communication with you regarding your horse. Caring, cautious handling of horses is high priority and we live on site. Safety and security of horses and equipment is insured with our on-site camera surveillance system. We know one size does not fit all horses. That is why we give special attention to the needs of each horse in our care. While we have regular farrier and veterinary services, boarders are more than welcome to use a different farrier or veterinarian of their choosing. 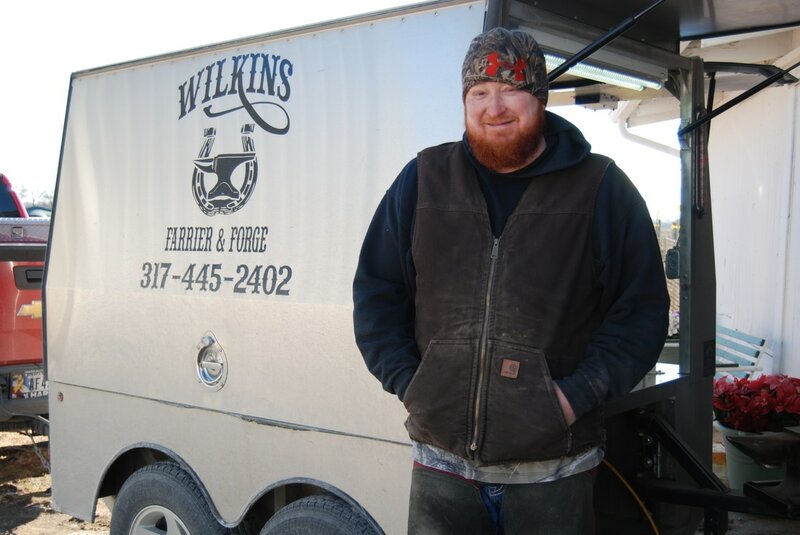 Farrier Service is provided by Ryan Wilkins. Ryan graduated from the Indiana State Horseshoeing Academy and went on to teach at ISHA for one year. 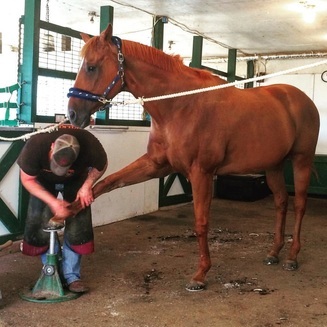 Ryan has a solid foundation of shoeing horses for a variety of disciplines, as well as specialized/corrective shoeing. Ryan has worked with many veterinarians, including Dr. John Hunt with whom he still works on special needs, corrective shoeing cases, and surgical cases. Ryan is always professional, keeps his schedule, and runs on time. He is also flexible and will work in an emergency shoe repair for your horse if needed. Veterinary Service is most often provided by the Community Veterinary Practice Service from Purdue University. We schedule annual barn visits in the spring and fall. Myk Bray, DC, DVM is a veterinarian and chiropractor that visits the farm regularly to provide horses with chiropractic care and other holistic health treatments. Kerri Marsh of In Line Equine is a certified equine massage therapist that visits the farm regularly and offers massage therapy as well as several other customized rehab strategies. We manage and personally administer all feeds. Our basic grain is Safe Choice by Nutrena or Top Line 32, a ration balancer by Kent Feeds. We will buy other feed brands if deemed necessary by the owner. We purchase and provide all feeds. The added difference in price over the cost of a bag of Safe Choice is paid by the horse owner. Every horse is fed grain 2 times daily. The amount of grain is determined for each horse by their weight and the amount of exercise they are given by their owner. We feed properly cured grass hay and grass/alfalfa mixed hay. Round bales are provided for most horses and are in safe horse bale feeders or inside hay huts. Square bales are always available and are stored inside each barn.